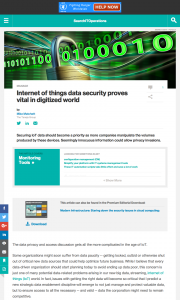 Securing IoT data should become a priority as more companies manipulate the volumes produced by these devices. Seemingly innocuous information could allow privacy invasions. The data privacy and access discussion gets all the more complicated in the age of IoT. Some organizations might soon suffer from data paucity — getting locked, outbid or otherwise shut out of critical new data sources that could help optimize future business. While I believe that every data-driven organization should start planning today to avoid ending up data poor, this concern is just one of many potential data-related problems arising in our new big data, streaming, internet of things (IoT) world. In fact, issues with getting the right data will become so critical that I predict a new strategic data enablement discipline will emerge to not just manage and protect valuable data, but to ensure access to all the necessary — and valid — data the corporation might need to remain competitive. In addition to avoiding debilitating data paucity, data enablement will mean IT will also need to consider how to manage and address key issues in internet of things data security, privacy and veracity. Deep discussions about the proper use of data in this era of analytics are filling books, and much remains undetermined. But IT needs to prepare for whatever data policies emerge in the next few years. Many folks explore data privacy in depth, and I certainly don’t have immediate advice on how to best balance the personal, organizational or social benefits of data sharing, or where to draw a hard line on public versus private data. But if we look at privacy from the perspective of most organizations, the first requirements are to meet data security demands, specifically the regulatory and compliance laws defining the control of personal data. These would include medical history, salary and other HR data. Many commercial organizations, however, reserve the right to access, manage, use and share anything that winds up in their systems unless specifically protected — including any data stored or created by or about their employees. If you are in the shipping business, using GPS and other sensor data from packages and trucks seems like fair game. After all, truck drivers know their employers are monitoring their progress and driving habits. But what happens when organizations track our interactions with IoT devices? Privacy concerns arise, and the threat of an internet of things security breach looms. Many people are working hard to make GPS work within buildings, ostensibly as a public service, using Wi-Fi equipment and other devices to help triangulate the position of handheld devices and thus locate people in real time, all the time, on detailed blueprints. All you storage geeks and science fiction fans rejoice! If Cloud Constellation gets its way, you’ll soon be able to directly hybridize your dreary earthbound data center storage with actually above-the-clouds storage. Yep, protect your sensitive data by replicating it to true satellite storage. Only James Bond with a spare Shuttle would be able to hack those things. Just how far fetched is this idea? We’ve always admired StorSimple from before Microsoft acquired them. And what was Microsoft up to, getting into the storage infrastructure space? Well, if it wasn’t apparent before it is now – Microsoft StorSimple is a great on-ramp to the cloud (Azure naturally), especially if formal executive sponsored cloud transformation initiatives just aren’t in the cards for the rank and file IT organization. And this week Microsoft just announced a virtual StorSimple appliance option that can help accelerate cloud transformations even faster. January was a time to make obvious predictions and short-lived resolutions. Now is the time for intelligent analysis of the shark-infested waters of high tech. The new year is an auspicious time for new startups to come out of the shadows. But what is just shiny and new, and what will really impact data centers? 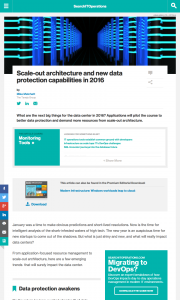 From application-focused resource management to scale-out architecture, here are a few emerging trends that will surely impact the data center.